How Challenging Each Other Helps the Craft - Satisfice, Inc. I can see that you like to meet people on your terms, and that people whose terms are significantly different from yours, or people who can’t adapt themselves to your terms, will have a hard time finding themselves in camaraderie with you. I don’t mind having a sharp discussion with someone if I have already built some bonds of congeniality with them. My brother is the sharpest tester I know (yeah I know, tester-brothers, it’s been done) and because of preexisting bonds he and I challenge each other, often bluntly, fairly regularly. But if someone I didn’t know challenged me as bluntly, I’d be a little put off and probably wouldn’t engage him. You might argue that I’m missing out on an opportunity to grow — and perhaps I would be — but my terms involve building at least thin congenial bonds first. That’s how I know that the challenge is meant to be in our mutual best interest. [James’ Reply: Yeah, I can see that. Well, you don’t have to engage anyone. I’m just trying to explain why I engage (even with strangers, most times) and why I respect those who do and why I suggest you might want to, as well. Take it or leave it, as you like. It’s simply a requirement to be respected among the people I hang out with. So how do two people with styles that don’t mesh, as I suspect yours and mine don’t, learn from each other? Who gives in? Shouldn’t both adapt at least a bit, moving more toward the center? Oh, wait, there’s my style again. I’m working on my first ever blog post ever as we speak. It’s got a catchy title “Teach Yourself Testing: Ten Year Crash Course”. Nice post, James. I’m very much a believer in challenging myself, my assumptions, my peers, my industry and my work. I firmly believe that’s part of how I grow and certainly it’s part of why I enjoy my work. Some of this, I’ll be honest, I attribute to you. An aspect of my grounding in testing and test theory was taking the beta of a class you were teaching on exploratory testing in 1996/1997 and I really enjoyed not just what you taught but the ability to question, provide another view and even argue with you. I liked the fact that testing was not a formula and required active participation and constantly changing ideas and thoughts. My nature is that of someone who explores the inside of every box presented to me and then tries to get outside it for a different view, maybe with different glasses. I may not be “right” or even “win” but I come away with new knowledge every time. You and I have somewhat similar styles, though I’m not as prone to biting, but I’ve never been afraid of you nor of having a lively discussion about something we disagree on. In part because I have a relatively thick skin and in part because I like the process of the questioning and discussion. But my style appears to be different than Lanette’s and I know it’s different than your brother’s. I adjust mine also, as needed by the audience, but I don’t stop being me and I don’t stop my basic desire to question and learn. I am really NOT a “go along” person. If I disagree, I will say so. If I agree, I will also say so. Wouldn’t I do a disservice to whomever I was having a discussion with if I was merely a “yes woman”? It would no longer be a discussion. I’m polite, I’m professional, I’m nice. But I’m not someone to sit quietly in a corner and listen to anyone pontificate. As to camaraderie, the actual definition of it implies being light-hearted and convivial but I’d prefer to take it back to its roots of “comrade” and look at that. Are not many of us, indeed, comrades. We are comrades in an ongoing desire to improve our profession, our industry and our practices. I don’t need to be completely in agreement with someone for that. Heck, sometimes I’m not completely in agreement with myself. I agree with most of this post but I’m going to play the sexist card. I’m a guy. I would expect the same courtesy to be extended to me as to the women you won’t bully. Not just for my sake, though. I don’t want testing to be a two-tiered profession because of our . . . um . . . tackle. [James’ Reply: It’s not my intention to bully anyone. I just don’t consider it bullying to come at you with the full force of my authentic personality. You should be able to take it. If you can’t, then you’ll learn. I expect from you only what I expect from myself, because I believe you are like me. I like the concept of the thought experiment where you test a clock without giving it input. However, I’d like to question its’ legitimacy. At some point in the past that clock has been given input. The input maybe in the form of someone adding batteries, winding up or adjusting the mechanism. The difference is that a) someone else may have provided the input and b) that input may have happened some time ago. Either way those input provide the basis of the test case. And if you so much as look for an expected result (e.g. checking the time), even if YOU don’t provide input, then you are conforming to the IEEE definition of the term ‘test case’ because someone else has provided the input. [James’ Reply: If you are going to be that liberal with your interpretations, why not throw the definition away? What is it doing for you? Anyhow if you consider it input (I wouldn’t) then you must also believe that such input is part of the test. But how can it be, since the tester has no idea what that input was and therefore can’t fully know what the test is that he is supposedly performing? Can you test a clock when you can’t give it input? * Turn off the light – maybe the clock is photo-voltaic? * Change the temperature in the room. But then again when has “Don’t Touch That!” really stopped a serious tester from testing? It’s also somewhat gratifying to know that I am not the only one who does test cases in bullet form. I like being challenged. I don’t assume that I know everything. I see that could be other/better/different ways out there. It doesn’t faze me how the challenge occurs unless it gets personal. Then I won’t hear the message – I just hear noise. I’m a student of the craft. I’m learning. And to paraphrase Bruce Lee, “I keep what is useful and reject what is useless”. That may not happen unless I’m challenged (either by myself or by others) so that I can determine what is useful and what is useless (to me)! Recently I asked you a question on how to build communities? You gave some excellent insight and ideas on a peer conference (e.g. LAWST – http://www.lawst.com ). I liked that idea. Similar minded peers discussing/debating topics of interest. You then CHALLENGED me to start a similar type conference here in New Zealand which you then tweeted! [22/06/2010 2:43:19 p.m.] James Bach: So I just outed you by tweet. Will it help testers in New Zealand? I believe it will! Will it be a challenge before/during/after the conference? You bet! BUT i can see that the challenge can help our craft become much stronger. I think being challenged and taking up challenges is a necessary part of a thinking tester. It’s like when you try to teach/talk to a colleague about a topic and the “why” and “what do you mean by that” questions come up. So, either way it forces you to think, analyse what your own pre-conceptions are and understand more detail of what you’re trying to say. This self-evaluation is key. So, challenges per se are a “must” or a /good/ thing. Of course, how people respond to them is a more personal thing – sometimes it’s instant and sometimes they need their own space, go away and think about it. Ruminate, cogitate and then respond, maybe. But it’s the thinking that’s important – and even showing your thinking. A good while ago, when doing maths at school and college “showing your working” was actually quite important – it was an insight into your assumptions and map-making to come to a solution, idea, hypothesis, conjecture etc. I try to re-use that idea – not only because it can help others understand my point or question – but I might re-visit the idea sometime later and then it’s a useful reminder about what my own assumptions were “at the time” – they might not hold true longer or been forgotten. Plus it helps to stop things getting lost in translation – even when you have the same language! I’ll stop before this turns into a blog post on your comment page. Thanks for the post – it prompted me to think a bit about the topic – and why I think challenges are a good thing, but responding to challenges and “showing your thinking” are even better! Nice! I want my team to test. I don’t want them to spend any more time than necessary writing test cases (or writing anything that isn’t absolutely necessary, for that matter). In many cases, that means jotting down bullet-point test ideas, rather than paragraph-form prose. All I really ask is that they put their work products on our intranet site so that we can all share and learn from it. I get some nervous feedback from newer members of my team (“what template should I use?”, “is that really all you want me to write?”), but eventually they learn that I trust them to do whatever works for them, as long as it works for the company as well. Thanks for the reminder. I think of Anna occasionally as well. We used to work together on the QA team of a now-defunct software company. While she was a person full of terrific ideas, she was always open to new ones. The first task I was given when joining the company was to implement automated testing, and at the time, Anna was the company’s biggest skeptic concerning test automation. I knew I had cleared a major milestone when I was able to “convert” Anna, by helping her team begin to automate some of their test efforts. Anna and I remained friends when the company went downhill and we each moved on, and we often had some great discussions about software and testing. We had lunch shortly before Sept 11. I still miss her – our profession is poorer for her absence. Just had the CITCON (Continuous integration & Testing Conference, http://citconf.com) in Wellington. It is an unconference and I put the topic up “Test Automation != Quality & != Testing”. This was probably the most visited session of the conf and the most hotly discussed. It digressed quickly to how we do testing today and where everyone was coming from. I think we all took away heaps of thoughts from this discussion and it made me proud that there is so much enthusiasm in NZ on this topic. Be it developer or tester. I think there are now 45 people more that have realised that testing is not just as simple as some make it out to be, that it can be far more complex than anticipated and -most importantly- it IS open for debate. I had that question given to me at an interview at Microsoft in 1995, not sure if you learned about it there… but I laughed out loud when I read your post. It’s a great problem, and I think I answered it rather poorly, but I was young then and wet behind the ears. As to your post, I’ve never taken criticism personally, but I think many do.. it’s a shame really, since I never learned by following the lemmings off the cliff – I’ve learned fundamentally from being challenged and dropped on my head. If everyone told me that my approach or ideas were gospel, well.. then, I’d be …. king of the universe or something. A good discord is great for the soul. Not really on this topic, I’m curious what your take is on BDD using tools like jBehave or Cucumber. I seems to me an early offshoot of Keyword Test Design (which is my baby). I’ve been experimenting a ton with it lately, and it really is some neat stuff. In many respects it offers some additional context to test design development that maybe keyword automation is lacking, but I’m curious how or if you’ve played with these tools/method and what your opinion is as to it’s ability to support using ET methods of test creation and it’s eventual execution automatically. [James’ Reply: Actually I find the whole concept troubling and misguided. Perhaps I have not seen it demonstrated properly, yet. Cucumber seems worse than that, because it seems to be touted as a way for people who aren’t programmers to write test automation. This is dangerous because people who aren’t programmers are much less likely to understand the limitations or capabilities of the tool. The tool DOESN’T understand English, so the ability to write “english-like” statements and have them executed as tests creates the risk that non-technical testers believe the tool will automatically understand and handle things that it can’t understand and can’t handle. I have not seen examples of really interesting tests written in Cucumber. But the more interesting the test is, the more I would worry about people not understanding what the computer is actually doing when it runs the test. I’d rather see terse tables of test data driven by hoary scripts presided over by a toolsmith who knows what he’s doing. As for the question, yes, not exactly asked that way, but very similar.. the question was.. (not exactly this, but I’m paraphrasing here) “Here is a clock, you can’t do anything to the clock (anything I assumed implied touching, moving, etc), how would you test the clock to make sure it keeps time accurately. (something to that affect)… it definitely threw me for a loop, but it was fun none the less trying to answer it.. I can’t remember exactly how I answered it… but I remember a lot of silence on the other end of the phone interview (I still was asked to come back for another round.. but didn’t take them up on it). James, how about a little more rigor, a bit more precision, in defining the product under test? In this post, you illustrate with a clock under a glass dome, and you also make reference to the same item in responding to William Echlin’s comment. In your transpection with Michael Bolton, however, you imagined “…an acrylic box. Inside the box runs a clock.” This is testing two different items. Mentally, I envisioned your acrylic box with the clock inside: a large, six-sided, ticking die. One of the first tests I imagined was measuring whether the clock would operate identically regardless of the orientation of the box. Valid test: I cannot interact with the clock, but nothing I read in your requirements limited my interaction with the box. Returning to your blog, some of my test cases are irrelevant because the item under test has morphed from an acrylic box to a glass dome. With one product, measuring the clock’s accuracy while it is upside down is a legitimate test case; with the other product, it’s an ID-10T error. Or, as you said to Michael in the transpection, “You can’t just make things up, my friend. It helps to have definite ideas about what words mean.” The product is NOT the clock, contrary to what you stated. The product is either the clock in the acrylic box, or the clock in the glass dome; either way, these are two different items which will have different tests. James, my challenging colleague, it still seems like you’re asking for two different things. There’s a reason the clock’s container is glass/acrylic: I have to have some sensory input. Only if I have sensory input that can be traced to the object do I have interaction with the object under test. Sensory input is to some degree quantifiable, and can be compared to similar input from available oracles: this, to me, qualifies as a test. A conditional limitation is not a complete absence of interaction; that would be an unconditional limitation [or an unlimited condition?]. I contend that you cannot test something for which you have no knowledge, no awareness, no sensory stimulation. Give me sensory input and an oracle, and I can test. 1. turn on/off the room lights – maybe it’s solar powered – Can I cause the batteries to drain/charge? Can I force the display to “sleep”? Can I see if the display is lit/backlit in the dark? Can I tell if the display changes gets brighter/dimmer with lights on/off? 2. inducing radio frequencies – maybe it’s “atomic” powered – can I interefere with the radio reception that controls the settings? Can I inject changes with radio waves of my own? 3. magnetism – can I induce a magnetic field that interrupts the clocks mechanism? If it’s digital, possible? How about mechanical? 4. simple comparison – can I compare the clock under the glass with a similar make and model that I can manipulate/touch/feel/shake? (maybe using the clock in the glass as a control?) How about comparing it with my wristwatch or cellphone? 5. temperature – if I change the temperature in the room (hotter/cooler) can I detect any changes in the clock? 6. pressure – if I change the pressure in the room can I detect any changes in the clock? 7. back to the comparison – can I go home and find a similar make and model that I can interact with? For those ideas that didn’t involve manipulating the clock (comparing it to wristwatch) I would ask whether not giving the clock input meant you were still testing it? Testing requires configuration, too. 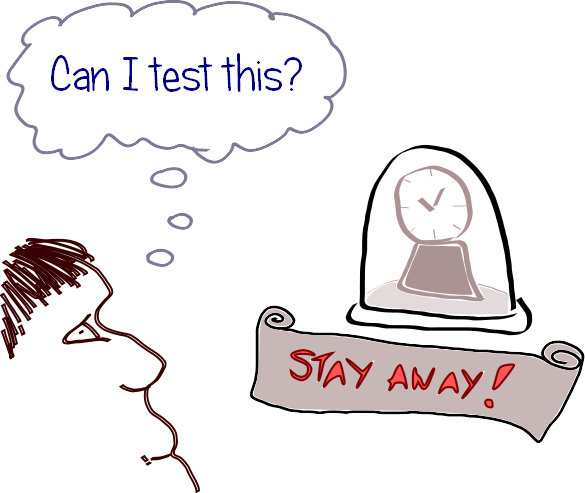 Can you test without configuring the clock? James, taking your pulsar example (even though I’m not an astronomer) couldn’t I evaluate the object like scientists do? They learn about, examine, determine the rules, etc. even though they can’t directly interact with it. In this case, testing isn’t so much about breaking the object or even seeing if it matches a predetermined set of specifications. I would argue that, through observation and non-destructive means, we are actually testing (maybe learning is a better word) what the specifications (rules) are. [James’ Reply: I agree. That means you can test something without INTERacting with it. As long as it’s doing something, and you can observe it in some way, and you have some way of interpreting the results so as to say that it seems to have a “problem” if it does have one, then that sounds like testing to me. If I’m observing a pulsar from 100 light years away, everything is forced into an observation-only mode. AND if I know nothing of pulsars, then I start out like the blind men investigating the elephant. My initial assertions may be flawed, but as I continue to observe and gather data I have continued opportunities to refine or rewrite my hypothesis. I would say that this is where astronomers, cosmologists and the like differ from other scientists – they don’t always get to benefit from direct interaction or manipulation of the items under study. Taking what little I’ve learned and forming it into a model, whether concrete and physical or a simulation on a computer, I can start to interact in a more physical manner and applying direct inputs, different conditions, etc. A good friend of mine, who worked in the aerospace industry, has often commented on how they built satellite and rocket systems that had all of the components tested without actually putting something into space. This form of testing relied heavily on models and simulators to determine things like flight characteristics, system interfaces, etc. Not saying that the aerospace industry is perfect, but they have managed to put many kinds of complex objects in the air and into orbit, successfully, with this kind of approach to testing. I think we test, in many cases, without knowing what the configuration is or having the ability to change it. I can think of times where I have had to do large scale integrations of systems, many of which I didn’t own OR have control of. In which case, it didn’t limit me from using them to evaluate other systems that I did have control. What it did, however, was force me into a position of a risk-based decision – A) do no testing or evaluation of any system because I cannot control one or B) call out the risk and evaluate what I do have under my control. Either position has risks, but option B gives me some opportunity to learn about the systems, even though it may not be complete. I am not much into testing as for now but your video(on Google) and this blog has inculcated deep sense of respect for the field of Software Testing in my heart. I do alot of questioning and analyzing at work, work that my peers do or work done in other departments and it’s so much fun and above all our work becomes more credible. I read about “Meeta Prakash” on this blog post and came to know that we work for the same company. Just waiting for more of your blog posts! It is an interesting logical clock puzzle you have put forth. I’m going to take you up on it, but only if you meet my own challenge to stick to your definition of the clock and restrictions surrounding it. Any solution is invalid if you change the base definition. If I misunderstood your base definition I will concede defeat, but if my solution applies, you will have to concede. That is the rules. [James’ Reply: There is no ultimate right or wrong solution in my puzzles. The point is how you think them through. That’s the learning we can use. I would ask my friend Joe to open the acrylic box by using solvents such as di- or trichloromethane to remove the acrylic. Then I will instruct Joe how to handle and perform any test deemed necessary. At no point in time will (I) (see: YOU can’t interact with the clock) be directly interacting with the clock. [James’ Reply: Okay, you’ve done something that all good testers ought to be able to do when confronted by an obstacle– try to overcome it. That’s good. Can you also solve the puzzle WITHOUT overcoming this obstacle? What if no one is allowed to interact with the clock? What if, say, the “clock” is light years away (you can see it in a telescope… it’s very big and bright) but you want to do tests in less than a year? Yes, it is possible to test the clock when you can not interact with the clock except to see it. I believe many readers have already suggested ways to test the clock without handling it physically. In fact, it is even possible to test the clock without the clock even existing. Testing the clock is as much about the clock as it is about the tester of the clock. The quality of the clock is determined (measured) by the tester (end user) based upon certain criteria or preconceived expectations. Coming back to the non-existing clock, I’m going to ask the help of my 5-year old daughter to test your clock that doesn’t exist yet. I told her all about this wonderful new clock that lives in a glass jar. I further told her that my friend is building a factory to build this glass jar clocks but the first one will only be available in 2 years. She only asked me one question: “Daddy, is it pink?”. I had to confess, sorry, it only comes out in black. She decided that she doesn’t want one, since she loves pink. In the example above you may translate it to a market survey. In conclusion, testing is always possible, but there might be limitations to the amount or kind of testing that may be performed. Anticipating and compensating for possible violations of expectation is key. James, I would say that your example of a clock under glass, while thought provoking, does not invalidate the definition of a test case as input and expected response. In this case, the expected response is that it display the correct time regardless of input, short of input that damages the clock. So test that – test that it display the correct time. Confirm that an initial input was to start or wind the clock. Ask whether any physical stimuli to the clock case was within the scope of testing. Confirm time zone. Monitor accuracy over a period of time, and ask over what period of time you will be allowed or expected to test the clock. BTW, I come from an Electrical Engineering and hardware test background, so I am more comfortable with the IEEE definition. However, I can definitely understand your desire to use a different definition that you feel is more comprehensive and usable. [James’ Reply: I come from a science and philosophy background, so I like definitions that stand up to critical scrutiny. I think you should want that, too. Look, you can’t give the clock input. You seem to want to include all conceivable past input provided by anything or anyone in your “test case.” Aren’t you working a bit hard to maintain your definition? You might as well call all of history a test case and be done with it. Finally, you seem to have a very different style than I do. However, I will say two things: Test is almost by definition challenging the correctness/completeness/speed/etc. of an object. And the path I take to accepting an idea or point of view generally involves challenging it. Hi, James. I’m pretty new to the blogosphere and I must admit I’m big fan of yours. I’ve writing for couple of months now (in Finnish) and when I revised my earlier posts I noticed not all my posts have the facts there need be. I read your blog a while ago and I got the spark to challence myself! So I wrote a post about testing my own bloggings against my own expectations when I wrote them. Although I challence myself (someone’s shouting “Biased!”) I learned a lot and I hope it makes my future blogging more mature and more “user fiendly”. The reason why I posted this comment here is that I cited you on my post. I just tought it would be appreciated if I let you know myself. [James’ Reply: Hi Pekka, thanks for writing. From what I can tell through the Google translator, you seem to be a “sapient tester” blogger. I’m glad to see that. Interesting problem, testing a clock (or, if you like, a pulsar) that you cannot interact with. One question I have is “test it against what, exactly?”. On the surface, you would just take a (purportedly) accurate timepiece and verify that the clock’s output (movement of hands) is accurate with relation to your device. Unfortunately, any clock you use for verification is just another instance of the very thing you’re testing. Who can say that it is accurate? All it leaves us with is that we can verify with a degree of certainty that the hands (or, indeed numerals) are moving (or changing). We cannot accurately measure whether or not they are moving or changing at the correct rate. Applying the same reasoning to the testing of a pulsar, the whole exercise would seem to be topsy-turvy. You would be better testing the operation of your timepiece against the output from the pulsar. Although, proving that would be difficult since we have had to use the same flawed measurement devices (however accurate we regard them) to measure the spin rate of the pulsar. Knotty one, that. We also have to remember that hours, minutes, seconds et al are something we have made up to try to encompass the concept of ‘time’ and it’s value to us. It was never necessary until the church started trying to have regular services. Additionally, since time and space are so securely linked and we know that gravity affects the ‘shape’ of space, the proximity to a gravitational body would affect the output. I guess it’s one of those questions. No real answer but that’s OK, it’s the path you take that’s important. One last thing, you give the example of a pulsar 100 light years distant and suggest that the distance makes it impossible to interact with. Well, every object that has mass (ie. all of the particles that make up ‘us’) have a gravitational effect. Gravity is a weak force but it has incredible (and arguably infinite) reach, meaning that we can’t NOT interact with it, however feebly. Just being there has a miniscule but very real effect.